ICU MSCRM: ICU - Do You See Me? ICU - Do You See Me? Welcome to my first post on ICU-MSCRM! Let me tell you a little about my background with Microsoft CRM. I work for a small network support firm in Charlotte, North Carolina called gTECHserv. We are Microsoft Certified Partners who specialize in Network Infrastructure. Our clients are primarily small businesses, and we deploy and support Microsoft Windows Small Business Server for them. Some time around the end of 2003 or beginning of 2004, I attended a presentation on CRM at Microsoft’s campus here in Charlotte. The presentation consisted primarily of screenshots of the Outlook client. We immediately thought of two of our clients that have pretty sales-intensive organizations. Both of them relied on highly customized (and overloaded) ACT systems to manage their sales leads. We were also looking for a product for ourselves that would replace the two systems we used to track our clients and support requests. We used ACT for the contact management part of our system, and a ticketing system called Front Support that integrated with ACT. It worked well enough for us as a small company, but we had some growth plans and plans to improve the service we were delivering to our network clients. We also had to have three screens open all the time: Outlook to monitor our shared support inbox, ACT, and Front Support. It was pretty burdensome. In addition, there were no really useful reports that could be pulled, and no integration with accounting. So I was tasked with deploying CRM on our SBS 2003 network. As partners we had 5 licenses for the Professional Suite of CRM. A note about my background will be helpful here as well. I had been working for gTECHserv for about a year at that point. I was primarily “the web guy.” My background was pretty heavy on marketing design, communications, and web design. Not a technical guru at all. I had some basic knowledge of network issues and Windows, and very little database knowledge. So, needless to say, I was in for a steep learning curve. I guess I was chosen for this project because our primary business is network infrastructure. I was always performing work on the periphery of our core competency anyway – kind of a jack-of-all-trades. I started by reading the Implementation Guide (IG) and diving in. Fortunately, our production network is pretty straightforward. Over the next two months I installed and customized our CRM solution with a heavy focus on the customer service module. The owner of our company was pretty adamant that the main value he saw coming from this deployment was from the reporting side, so I dove into Crystal as well. Our CRM system was kind of a living, changing beast for about 4 or 5 months. Which is one of the great things about Microsoft CRM. It is so easily customizable and flexible that we could tweak it continually until our workflow and reports were exactly where we needed them. So anyway, I installed CRM on their SBS box, which fortunately is here in our very own server room. I was able to play with it a lot before letting their beta-test sales folks onto the system. One of the biggest challenges with their deployment has been their workflow. First, they have about 30,000 leads in their database. (I’ll cover their migration from ACT in another post.) Each salesperson is supposed to make calls to their leads every 30 days in order to keep a lead “protected” so no other salesperson can swipe them. So each salesperson maintained anywhere from 100 to 200 leads that they worked on a regular basis in addition to their sold clients. The remainder of the leads are free for anyone to call. In ACT I ran rules for them on an irregular basis to move leads out of their buckets and back into the shark tank. It was a challenge to recreate this workflow for them in CRM. 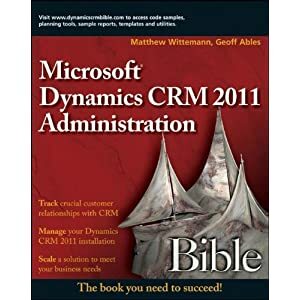 I ended up writing 5 or 6 manual workflow rules that refer to each other in loops so that leads are constantly moving in and out of the salesperson’s bucket depending on whether or not they created an activity for them in CRM. This took a lot of diagramming and testing and refining. There are still a number of tweaks I would like to make to it, but I’m kind of wanting to see what enhancements there are to workflow in CRM v2. Meanwhile, let me know your experiences with CRM. I want to hear from you!